To see more mouth-watering photos of sweet treats, follow @eatwanderlust on Instagram. 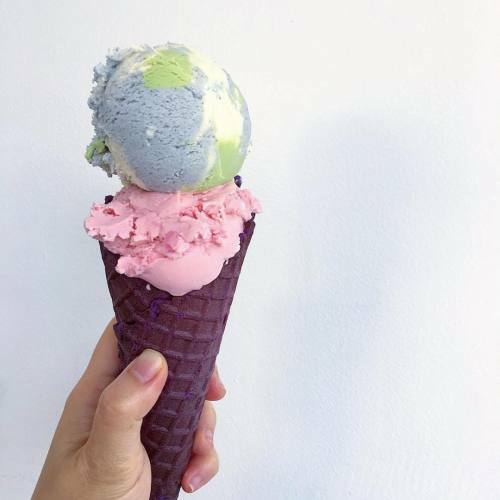 It may be #NationalIceCreamDay here in the U.S., but the moment falls in a month where our planet is yearning for sweetness. Enter the small team at Wanderlust Creamery (@eatwanderlust) (@eatwanderlust), an ice cream shop in Los Angeles with travel-inspired scoops like Thai sticky rice and mango and Mexican horchata con cafe. “Adrienne is the brains behind all of the flavors,” JP Lopez says of his girlfriend, Adrienne Borlogan. Before opening their shop in August 2015, Adrienne was bartending and developing cocktail programs for a large nightlife group; JP was practicing law. Ready for a change of pace, the couple took the leap to Wanderlust. “We’re in the business of creating (and re-creating) happy experiences through ice cream,” JP says.